Formula 3 has a long history in Britain with the first national championship being competed as early as 1951. Until the end of the 1970s it was common for different clubs or promoters, such as MCD, the BRDC and the BARC, to run separate championships. Since 1979, the BARC and BRDC have run a unified championship. Autosport sponsored the first three national championships from 1951 to 1953 after which the BRSCC championship ran until 1961. After an interruption for Formula Junior, the MCD series emerged in 1966, then under Les Leston's banner, and ran until 1974 producing such champions as Tim Schenken, Emerson Fittipaldi, Roger Williamson, Tony Brise and Brian Henton. 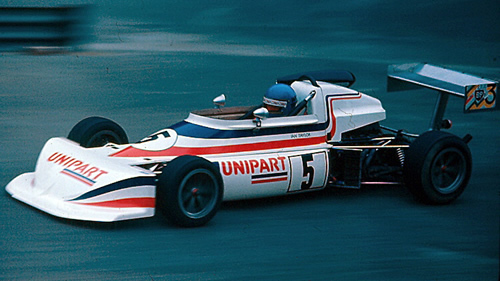 A rival BARC series started in 1972 and was won by Williamson, Ian Taylor, Henton, Gunnar Nilsson, Rupert Keegan, Derek Daly and Nelson Piquet up to 1978. A BRDC series started in 1976 and could boast Bruno Giacomelli, Stephen South and Derek Warwick as its champions before merging with the BARC series. This series, with Vandervell, Marlboro and Lucas as title sponsor continued to be a production line for F1 talent throughout the 1980s. Ayrton Senna and Martin Brundle went straight into F3 after their 1983 duel but the British F3 champion could generally expect to step up just to F3000 thereafter. All results and car histories compiled by Chris Townsend. Please email Allen if you have any British or European F3 race programmes. 1950: Based on British post-war 500cc racing using motorcycle engines. The one-cylinder JAP engine was one of the most popular. 1964: 1000cc normally aspirated single-carburettor engines from FIA Group 1 or Group 2 cars (minimum production 1000 cars per annum), also using production gearboxes and commercial fuel. These highly-modified engines are now remembered as the 'screamer' era. Minimum weight 400kg; minimum wheelbase 200cm; minimum track 110cm; maximum body width 95cm. Air inlet restricted to 36mm. 1971: 1600cc engines but with a 20mm air inlet. 1974: 2000cc normally aspirated stock block engines with a 24mm air inlet. Maximum of four cylinders. Toyota, Ford, Alfa Romeo, Renault, Triumph, Volkswagen, Lancia and BMW engines were used successfully.